My 14 year old Kona has seen better days. Or to be more precise, certain parts have worn out and others are a bit ropey! It definitely needs the entire drivetrain replacing, including shifters, the front brake level is slightly broken and I’ve always thought the fork was too heavy for such a light bike. As I said in my part 1 post, that adds up to most of a bike, and could actually be as much as a new bike, but what would I get and which is better? So in this post I’m looking at the parts: what to get, what it would cost, and how would it change my bike. Currently my bike has Shimano Deore LX 9 speed. At the time this was brand new, and the groupset had just been released as Shimano’s replacement for its DX groupset. And I’ve been very happy with it. The brakes are phenomenal (still V brakes), the shifts very smooth, and shifters nice and light in action and a do-anything range of gear ratios. 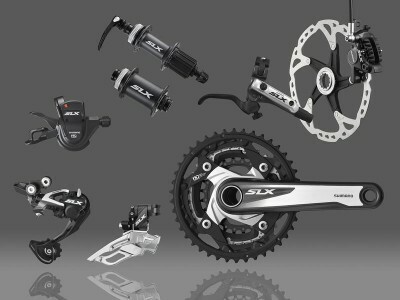 The direct equivalent today is Shimano SLX. This is now 10 speed at the back, with a choice of 2 or 3 rings on the chainset. Having had a look at the largest and smallest ratios you with 2 x 10, I worked out with the right choices I could get exactly the same range as my current 3 x 9 setup, but for less weight and shifting. I’ve had a look around, and although I found a great deal on a drivetrain only SLX groupset for £240, but its 3 x 10 only, at Merlin Cycles. However, they also have a 2 x 10 full groupset for £350. So if I sell the brakes, that would work out slightly cheaper than the 3 x 10. Perfect. Now my front brake lever is a bit broken – the barrel adjuster has snapped. It still works, but there’s no on-trail adjustment. My fork does actually have a disc brake mount, so I could use the front brake from the groupset (at a cost of £60) and just sell the back brake (my frame does not have a disc mount). That would require a new front wheel though. One of Merlin’s excellent handbuilt custom wheel’s with a Deore hub and Mavic XM317 rim would be £50. So that’s £110 for replacing the brake. Hmmm – that’s quite a lot! At the moment I have a 1999 Marzocchi Z1Bam. It’s 100mm travel and was cutting edge, if heavy, for it’s time. I’ve had a bit of a love hate relationship with it though. The weight is what really annoys me – if I pick up the bike in the middle, it tips massively to the front. The performance is ok; most people find it overly soft, but I’m relatively light (10 stone, ahem, ish!) and sit mainly over the back wheel and stay in the saddle most of the time, so I like its suppleness. I also don’t think I’ve ever bottomed it out – I’m not a jumper really. So in terms of a replacement, I just want something lighter really. One possibility is some Rockshox Reba RL’s – 100mm at £270. That’s the same travel , but lighter – I’d probably save 1.5lb I reckon. In total, that’s £610. For that I get the upgrades, and get to keep my beloved steel frame and the other parts. Granted my back wheel could do with straightening, but that’s all I think. So the next step is to see what that budget, enhance by a tax break from the cycle to work scheme, would get me as a brand new bike.